The Joy Formidable returns in with AAARTH, The Welsh rock trio return with yet another huge step forward, in the shape of fourth album AAARTH. It’s a punch in the gut compared to their previous releases focusing more on fuzz guitar and less on pleasing melodies, even though the melodies are complex and diverse. Propelled by their restlessness and curiosity, the band continue to sit at the forefront of inventive and aggressive guitar music, taking what can be done with the instrument to new levels with each album. AAARTH marks a transformative, near-psychedelic rebirth that channels long-held anger, soundtracking a chaotic global period of injustice and division, setting it against a deeply poignant backdrop of personal experiences and healing. Although the album came into being as the band travelled the globe and recorded in their mobile recording studio, the music intertwines the whispering hills of Wales with the otherworldly rainbow canyons of the Utah / Arizona border. It’s an intense, melodic and commanding piece of work. “Go Loving’ is one of my top two tracks on this collection due to it’s unblinking, clenched teeth psychotic approach and uber-cool fuzzed up guitar sound that is like a chainsaw. AAARTH’s cover artwork is by Fernando Chamarelli, a very talented painter, illustrator and muralist from Brazil. We were so drawn to the piece , it’s colour & dimension, the way you see a different symbol & layer every time you look. For over five years, Welsh trio the Joy Formidable have been making wonderful, headstrong records that combine hard-rock intensity with shoegaze’s dense trippiness. Wolf’s Law and The Big Roar are the easiest for American types to get ahold of, and if you dig bands like Curve, they’re probably well within your zone (but if I’m in the mood for this kind of thing, frankly I way prefer TJF over Curve). 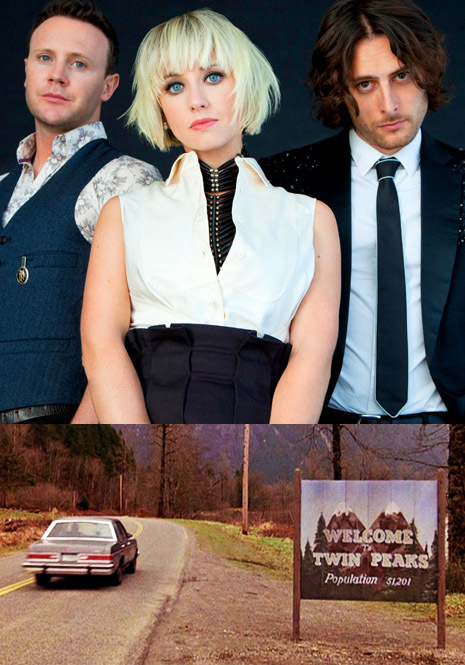 Just this afternoon, the band released a nicely reverbed-out cover of the Twin Peaks theme song, “Falling.” Between the series’ 25th anniversary taking place this year, and the announcement of new episodes coming in 2017, I suppose we should all brace ourselves for a lot of this sort of thing coming up. They (or someone) also cobbled together a video compilation of scenes from the series. Which is at once quite nice and too bad—a performance video probably would have been a lot of fun.